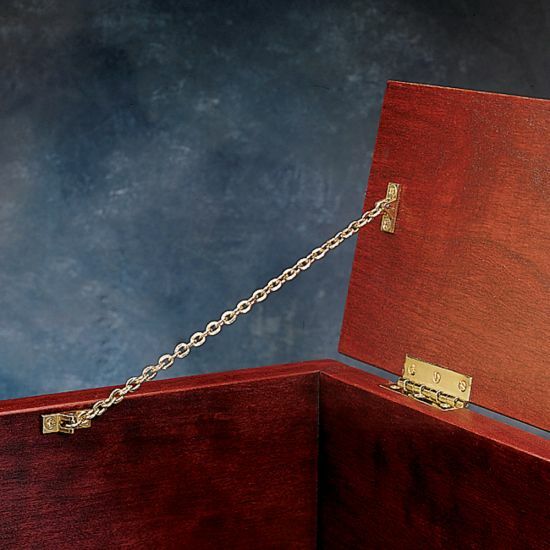 This decorative chain is the ideal way to support and dress up a box or chest lid. Chain and mounting hardware are brass plated and polished. 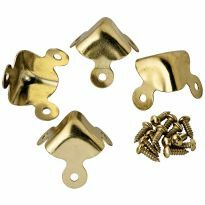 Mounting Plates: 5/16" x 1"
great product. have used several on small boxes when the lid is to heavy for the hinge. Can be installed inside any small box and positioned to limit how much pressure is on the hinge. 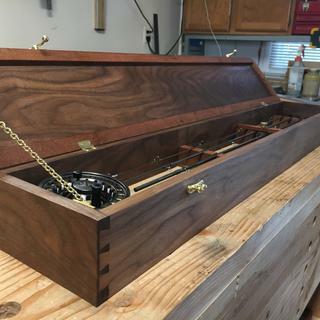 After completing this custom music box project I felt it needed a little something more. I found this beautiful decorative chain at Rockler and it is perfect! The lid has an oversized hinge but without the stop gap function so the chain solved this problem. I highly recommend this item. Great support. Easy to install and adds nice detail to the project. Live on Hawaii so getting quality hardware is difficult. I ordered two of these chains and the look and work great. This added a pleasing touch to a custom cabinet! The chain looks great and is a value at the price. I use then on several projects. It would be nice if there was a way to adjust the length. Being able to adjust the length would open the product to other projects. Chain support used for a fly rod/reel case. 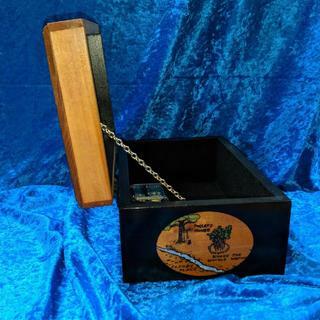 Great chain support for small boxes with hinged lid. It looks great and was easy to install. It was nice quality and looked very nice on the jewelry box I made for my Daughter. I've used this twice now in the boxes I've made, and I really like the simplicity and ease of install, and they look great! Very high quality and makes any box look good. You might think wow! 15.99 for a chain support for a jewelry chest is a little high priced. But I'm here to tell you. I was impressed with the quality of this chain support, when you open the package feel the weight of it and the craftsmanship of the chain and brackets you know you got your 15 dollars worth. You or who ever you get this chain support for will be able to tell, that it's not a 5 Dollar chain. It was the finishing touch I needed and easy to install. Expensive, but a good quality product. Chain links are welded and not crimped. Seams to be durable ready for many years of use. I have used screws and chain in the past, cheap but it works. This one box I made turned out so nice I decided to buy this chain set. So easy to install and it works great. But the added attachments made of nice brass really add that extra touch of class. 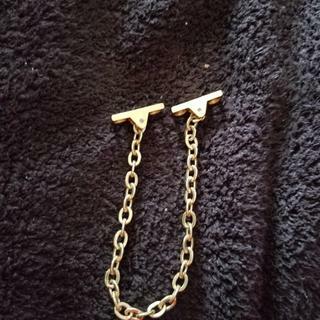 not the normal solid arm, so I believe it ads class especially the way the chain is made. This chain looks nice and works like it should. It's easy to install. Only takes a couple of minutes. Kinda pricey, but it does what it is supposed to do. I like this product very much. Well made! 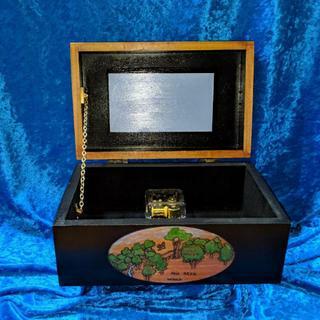 i made wooden hinges for my keepsake box and need an attractive chain stop to complement the tamarind top. The chain added a bit of distinction to an otherwise rustic look. Thankful to find that Rockler sells this, as it proved a lot harder to find that anticipated! The color, quality, chain length suits perfectly. If your box is thin/small, you may also find that the screws were too long. The screws require some space in between the mount and the box, which saved purchasing replacement screws for all four. Found replacements at local hardware store. Beautiful! Nice, sturdy chain. Looks pretty. I used longer screws than what it came with but that was specific to my job. The ones it came with look like it'll hold just fine. It's a support stop for 9 lb humidor lid. Does the job just fine. Good finish and easy to instal.Reasonable price. It is a very nice chain. Too bad I did not read the description; then I would have known that it would not work for which I had intended as a lid support on a large storage chest. After I got it I went back and realized that it was a close up picture of a jewelry sized box. I then read the reviews and the first 2 or 3 said they had used it on a large chest, but I cannot see how that could work when it will be used by a young boy who would fling the lid open. I am keeping it for use on a smaller box. Very nice quality. A very sturdy chain and attachments. 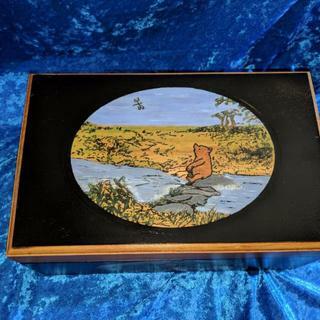 I would have taken a picture to post, but I made a keepsake box for my granddaughter and as soon as she saw it, out the door it went. I made a jewelry box for a wedding gift. This was just what I needed. My wife and I built a new bedroom suite out of solid cherry, My wife had her grandmothers dresser that she used, we dismantled the dresser to find out it was made out of old growth quarter sawn white oak that was painted. After cleaning up the wood, I made a beautiful jewelry box out of it for my wife, Now she has her grandmother dresser as a jewelry box. I was going to use a chain section, but this product gave a class of elegance to the new jewelry box. It is well worth the price, do not hesitate to use this chain support. This little chain is an excellent mid price item. Looks very nice, and is easy enough for anyone to install. Works great, heavy and decorative, for the grand daughters box lid. The chain and mounting brackets were more substantial then I expected and I really liked the design. It appears to be strong enough for a large chest lid. I used it on a Wedding Chest I'm making for my granddaughter. I'm very pleased with it. This chain was much nicer than the usual bead support. I had to shorten it a few inches but had no trouble doing so with a couple of pliers. I'm sure I'll be buying more in the future. The perfect item I needed to finish a 12&quot;x8&quot; black walnut keepsake box. Nice and solid, perfect for what I needed. 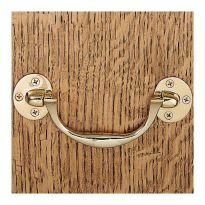 Finally - - brass screws with a hinge or support that didn't strip!!! I bought this and a lot of other trunk hardware to build a tack trunk for my daughter. A tack trunk is a huge box that holds all the stuff a horse rider needs. Saddle, bridles, and a bunch of stuff I don't know the names of! Two of these retainers are perfect for this fairly heavy lid. Rockler was the source for all the hardware for this trunk: hinges, casters, handles, corners, etc., except for the padlock hasp, which had to be chrome or stainless, and Rockler carried only brass in the pattern I needed. I had to go to a marine supply for that! I finished a top of the line kitchen. A few of the cabinet doors would get ruined if they opened too far into the range hood or in corner installations. I put 3 of these chains on the doors to make sure the owner's couldn't ding the doors or the appliances during use. She thanks me every time it comes into play. I have used the chain support for a number of years on my jewelery boxes. They work great, easy to install, and very functional. On a small box I would not use anything else. Great, inexpensive lid stay for jewelery box, etc. Quailty of construction is excellent and the shipping was very fast. Can't ask for more than that!!! I ordered 7 of these. One package was missing a mounting screw. I needed to go to the store to purchase a package of screws to make up for the missing one. You may want to insert a spare screw in each package just in case one is shorted again.Otherwise, I think it is an excellent product at a very reasonable price.Editor's note: Thanks for the suggestion Carmen. No need to purchase screws if missing, just contact our customer support at 800-279-4441 with your order info and we'll get them sent right out at no charge. Did not find what I wanted anywhere else. Price is too high! 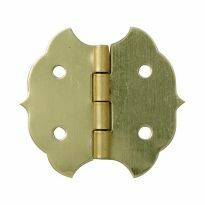 I was unable to attach the brass plated steel support from Rockler--too complicated. The chain is much simpler. 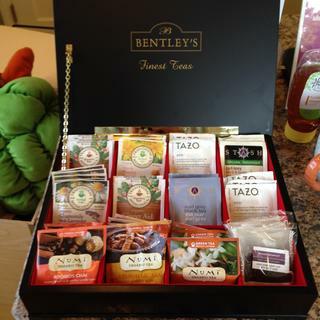 it is a very nice touch to a home made wooden box. I just completed a cedar chest and wanted to finish it off with these chain supports. like the style and they work great have used a lot of them over several years. Listed as used hardware for the blanket project in the October 2013 Wood Magazine Issue. Simple solution to a need. Made a nice box but it needs lid support when opened. easy to use. If they are too long for your project, it takes minutes to shorten them. Attractive. I am building wooden boxes to protect some valuable collectables and I wish to use this hardware. Best one I could find for my needs! I know Rockler to be a premium supplier. I love these chain supports. I make a lot of small boxes. For carpenters chest I am building. Because it is more original to a 100 year old cedar chest. 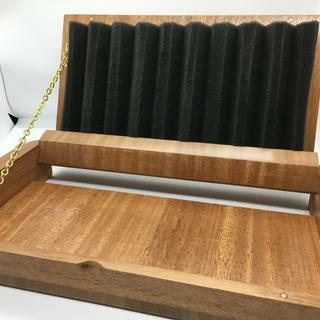 I've ordered one for a jewelry box I made for my daughter and I really liked it, so I'm doing the same for my granddaughter. Good online reviews...hoping the quality is as good as everyone says it is. Needed something to support a Jewelry box lid from overtravel. Is this adjustable? Just wondering if you can remove links to shorten. BEST ANSWER: Yes. You will have to back the pin out of the knuckle some. I used a fine nail set to start the pin backing out then a nail just enough to get the link out. I cut the chain to the length that I wanted and hammered the pin back in. It is a little tedious with smallness of the pieces but doable. The placement of the chain, farther up on the lid and or closer to the front of the box or case. I didn't consider removing any links. I thought it might damage appearance of the chain. You could try to remove the chain from mounting bracket and cut off links and reinstall to length that you need. i see no easy way to remove links. You would have to have a very small punch to pound out the holding pin, cut off links and then be able to then reinsert the pin which might be very difficult. The only way I see for shortening the chain is to move where it attaches to the side of the box. I did not shorten the chain for my needs, but at the mounting brackets there is what looks like to be a roll pin. I believe that you can drive the pin out, cut the chain to desired length, then drive the pin back into place. The chain is such that shortening the links is not very practical. Unless you have the ability to sodder, I would not attempt it. I don't think so unless you can solder in gold. Just change the mounting point. Do you have small ones for jewelry boxes ? BEST ANSWER: I used one for a box that was about 7 x 7 x 13. The chain could easily be cut down to for something smaller, but not if you needed a really fine guage. I can't remember exactly, but seems the thickness of the chain was about 1/8". I have used this chain on two jewelry boxes. Worked great. Will these work for a desk that folds up into a cabinet? BEST ANSWER: Yes and no. As it states in the description, it's decorative. It's probably stronger than it looks and would hold up for very light duty. But, if the lid is going to be used as a real desk with books and elbows leaning on it, I wouldn't trust it. I don't think they will work for you. They are kind of light weight and I just don't think they would support the weight. This is especially true if somebody was working on the desk top and leaned on it. I used them on a keepsake box. Jim, I don't think these would support a desk platform. 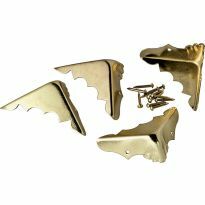 I used these for jewelry box lids. Not a god idea. that is a lot of weight for this chain. Is this chain strong enough to hold a fall front of a bar cabinet which supports drinks bottles and glasses? (I would install two of these chains at double length of 15" on each end of the fall front). Thanks! BEST ANSWER: I would say no. But if if were me I'd call to Rockler and ask them. They can tell you the weight it can hold. No - to much weight - I would want a different chain! Is there a 5 1/2 " chain for a game box application? BEST ANSWER: I was able to shorten the chain. I took the pin out of one of the "connection flanges", cut the chain, put it back, hammered the pin back into place. Was small to work with, but not very difficult. This chain has two flanges that can be moved forward / backward / up / down to make it fit almost any box. does this come in a stainless steel or brushed nickle? BEST ANSWER: They should really think about adding more options, especially some with "silver" look, such as stainless steel, chrome, nickle, or brushed nickle. The chain has to match the look of the hinges for a blanket chest, so you really have to find another product if you want a silver look, which is more popular these days. 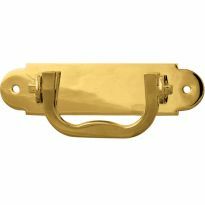 Peter - This is only available that I am aware in the brass colored finish. I believe its plated so you might be able to "pickle it" but it would be a dull looking finish. Dave T.
What type of screws are these for mounting? And what is the center to center of the bracket? BEST ANSWER: I POSITIONED THE BRACKET TO THE OPEN POSITION AT THE ANGLE I WANTED. THE SCREWS THAT CAME WITH MY BRACKET WERE STANDARD. the screws are phillips head screws. not sure of the center to center bracket.